Washington has threatened to quit United Nations Human Rights Council (UNHRC) unless it stop criticizing the Zionist entity over it criminal activities which have been condemned by the 193-member United Nations General Assembly for decades. “We are either going to reform this thing and make it reflect what it should be reflecting or we will withdraw our support for it,” US Secretary of State Rex Tillerson, a pro-Israel Muslim hater, told a House of Representatives’ Foreign Affairs Committee hearing on Wednesday. Tillerson said Washington would replace the mechanism with other means over its intermittent critical reports on the Zionist regime’s activities in the occupied Palestinian territories in specific and against Palestinians in general. “In the event US withdrew from the UNHRC, Washington would approach human rights issues on a multi-lateral basis with partners who see it the same way we do,” he added. The Zionist regime has history of criticizing UNHRC reports even authored by fellow Jews such as Richard Goldstone, and Richard Falk. Last year, Makarim Wibisono, PhD, United Nation special rapporteur on human rights in occupied Palestinian territories quit his quit the post blaming the Zionist regime of interfering in his work and running a character assassination campaign against him. In March 2016, the UNHRC appointed Canadian professor Stanley Michael Lynk as the new special rapporteur for the Palestinian Territories. After his very first report, he was declared an anti-Israel and Jew-hater. In the US, Canada and EU member countries the powerful organized Jewry have succeeded in equating genuine criticism of the Zionist entity with hatred towards Jews aka antisemitism. The victims include Jews, Christians, Muslims and even Hindus. One of the most pro-Israel US presidents, Jimmy Carter was declared a Jew-hater after the publication of his book, Palestine Peace Not Apartheid. The other world leaders who earned the title of anti-Semitism included Nelson Mandela, Hugo Chavez, Bishop Tutu, Ahmadinejad for calling Israel an insult to humanity in 2012, and how can one forget Louis Farrakhan. In February 2017, when UN secretary-general Antonio Guterres, a friend of Israel criticized a new Israeli law that will enable the construction of 4,000 additional units of settlements on private Palestinian land – he was declare a Jew-hater. The Human Rights Council is an inter-governmental body within the United Nations system made up of 47 States, elected for 3-year term, responsible for the promotion and protection of all human rights around the globe. 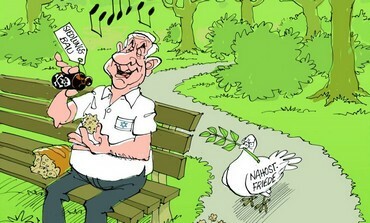 On June 11, Netanyahu demanded that United Nations shut-down its Palestinian Refugee Agency UNRWA allegedly funding the besieged Gaza-ruling Hamas. If some idiot believes Netanyahu – Iran must have a couple of dozen nuclear bombs by now to wipe Israel off the map.